How long have you been writing, and when did you decide to write a novel? I’ve been writing since I was a child. I remember writing a short science fiction story when I was eleven years old and received an “A”. I was so surprised! I had ideas for a historical romance novel in high school and still have the notes I made. Over the years I have written fairytales and short stories that are yet to be published. “Red Nails” came to me several years ago but it is not until this point in time that I chose to publish it as it is. And, the name for the novel came to me on a long drive late one night last fall and afterwards I realized it should have been so obvious. I did a “word search” on my manuscript that night and the references to “red” and “nails” were unbelievable. I will admit the story is intense but the circumstances of the story will allow the reader to see the reason behind this as they “experience” the novel. Share one positive thing writing does for you? Writing allows me to share my memories, imagination and feelings in the hope that somewhere along the way even one person will find a bit of understanding in their own life. I always hope that I will bring a moment of joy or hope to the reader in some way. ‘Red Nails’ sounds like a hot read, just right for Valentine month, how would you like to be romanced? I would love to meet and be loved by someone who will accept me for “me”. In the end, I think we all hope for this. Sometimes we think we have found it, but then it disappears. I would love to meet someone in the midst of a thunderstorm in a beautiful castle and find a love that lasts forever. A dream to hope for…..if this happens I will consider writing a sequel! Red. It becomes the color that Hunter sees every day. After fifteen years of marriage, her husband, Jon, leaves her and their life behind. 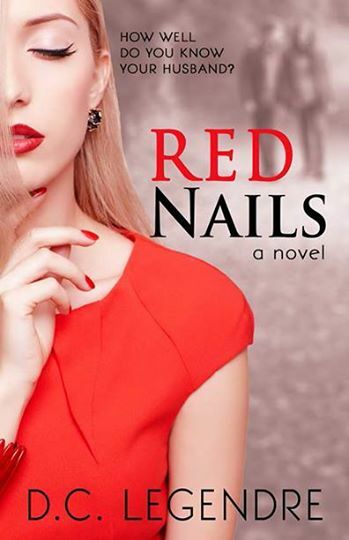 Hunter is left with the revelation that only she can find the truth behind all the comments about red nails, blonde hair and what happened to her fairytale marriage. One night she discovers a clue on a credit card statement and creates an alter-ego to tempt Jon… into a relationship that will be a source of laughter, discovery, fantasy, and tears. Intense innuendo is the basis for their communications and she learns more than she ever thought possible about herself and Jon. Red Nails is a story of endings and new beginnings and one of beautiful memories and hope for the future. D. C. Legendre is a freelance writer, aspiring fundraiser and designer who lives in New England. Thunderstorms, fairytales, and castles are some of her favorite things, as well as uncovering the mysteries in life. She believes without a doubt that life is an endless journey of the heart. Available now on Kindle AmazonUK, Amazon.com and paperback. This entry was posted in Books, Fiction and tagged #BHC, Book, D. C. Legendre, fun, Red Nails, romance, valentine on 17th February 2014 by Lisa Shambrook.